Why should I learn at the Freedom Flight Park? Lumby is one of the best places in Canada for free flight. We provide certified instructors, modern equipment including special training wings, harnesses with back protection, reserve parachutes, radios and helmets. The flight park boasts a massive, flat landing zone with a 2000' grass runway and taxiways. We don't forget that you're doing this for fun. Yes, paragliding can be dangerous so safety is our main priority but we also like to keep the "fun factor" high. You can learn at your own pace. We do not require you to sign up for a 5 or 10 days in a row course schedule as we know people have busy lives and the weather does not always cooperate. Between lessons, sit and relax in our Pilot's Lounge, an outdoor covered deck with couches, WiFi, barbecue & fridge and watch all of the flying activity: paragliders & hang gliders landing, powered trikes and occasionally even small planes taking off and landing. We won't mind if you purchase equipment from other vendors, it's a free market and that is your prerogative. We do suggest that you ask for our recommendation and/or inspection of equipment you plan to purchase. Check us out on TripAdvisor and see what people have said about their experiences. It's just a fun place! 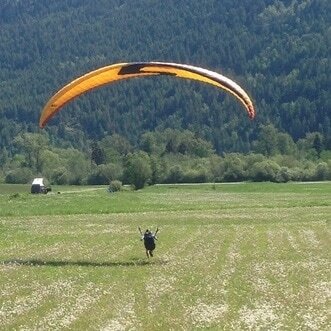 Do you want to try out paragliding before committing to the full course? Well this half day "taster" course may be for you. In this introduction to the sport you will learn how the glider works and learn to inflate and control the glider on the ground during a 2 hour ground handling session. Additionally, you will experience flight with a tandem paragliding flight. During the flight, your pilot will explain aspects of the flight such as the take off, general flying, the approach to the flight park and landing. Note: The cost of the introduction course is deducted from your P1 or P2 course should you decide to continue on with your certification. The main components of the course are listed below, by the end you will have a basic understanding of the theory coupled with applicable practical paragliding skills. Students may vary in the amount of time required at each phase of their learning. Typically the P1 course takes between 3-5 days to complete. A paragliding manual and log book is included ($75 value). ​You've got to crawl, before you walk...similarly, you've got to ground handle, before you fly! A large part of your initial training will be learning to inflate and control the wing on level ground. A common saying is that "every hour of kiting, is worth ten in the sky" in the amount of experience you gain. 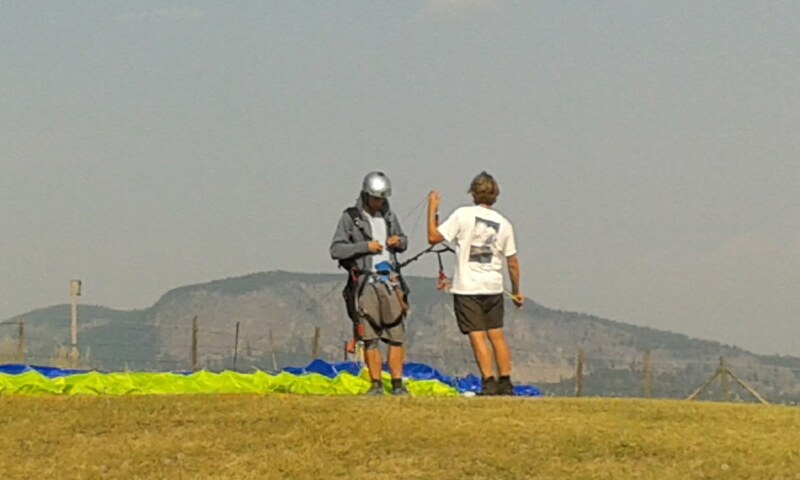 Essentially you are learning the "launching" part of paragliding. ​​​You will graduate to using your forward launching technique from your ground handling sessions to experience your first little "baby flights" by running down a small hill and flying just 5-10 feet above the ground. This is a more realistic simulation of a real launch with a little taste of flight and the landing. Most students do 1 to 3 sessions, depending on their endurance and speed of picking up the necessary skills. 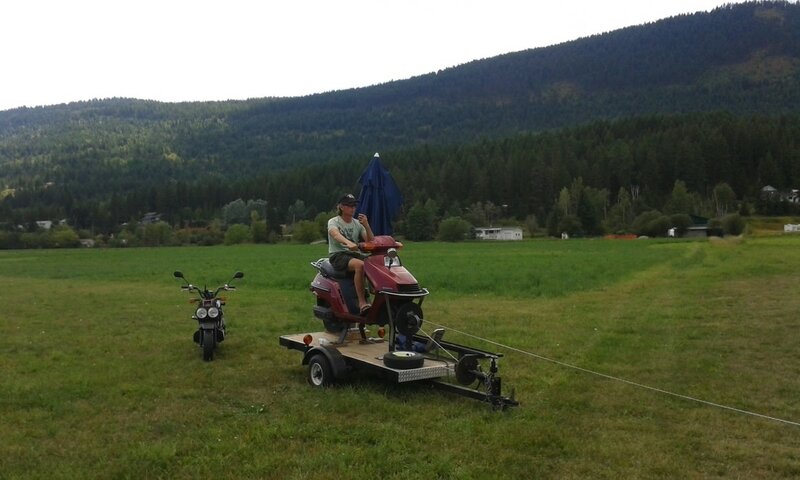 ​With the aid of a winch, you will be towed down a grass runway. At first you will only go up 10 feet, but later you will be towed up a few hundred feet. We have taken students as high as 800 feet! You will be equipped with radio so that you can hear the instructor's guidance. Here the main focus is your control of the glider in launching, flying and landing. ​Throughout the course, as you are learning these practical skills, your instructor will be infusing you with theoretical knowledge about paragliding, the equipment, free flight, meteorology and other related flying topics. To tie it all together and ensure there are no knowledge gaps, we will hold one or two classroom sessions. Once the student feel prepared enough, they can write the P1 test from HPAC. You will be on your way to soaring with the ravens, hawks and eagles! Now you will experience your first high flights from a mountain. Cooper's, our main launch, is 2000' above the Freedom Flight Park. Your first flights will be early in the morning, when the air is smooth and the wind is light. An instructor will accompany you up to launch to supervise in your takeoff while another one will be in the landing zone to guide you in on the radio. ​Your first flight will last 6-7 minutes...of pure joy! Additional ground school lessons to build on your knowledge from the P1 course will round out your skills and prepare you for the novice test (the cost of sitting the test is included in the course). ​To obtain your P2 rating, you require 25 flights and complete various skills to the satisfaction of your instructor in addition to passing the written test. You will be provided with an HPAC log book at the start of your course. Novices occasionally get frustrated when their thermalling skills are not advancing well or not translating into cross country adventures. Some remain patient and develop their skills through trial and error, some want a faster track. This one to three day (not necessarily consecutive as it is very weather dependent) course will look at the intricacies of thermal hunting and tactics for handling thermals. Introduction to XC planning concepts along with XC tips and tricks are covered. The Freedom Flight Park is situated perfectly in the Lumby Valley. A 10 kilometre triangle is possible from either of our regular launches (Cooper's or Saddle) and at all times, the landing zone is right in the middle, almost always on easy glide. Done that? Well expand out to the 25 or 50 kilometre triangle that have nice valleys with easy landing zones and plenty of roads for retrieves. Many pilots have completed their first cross country triangles in this area. Have you recently moved to Canada and you need to be certified by HPAC but have been flying for years? Or you haven't flown for years and need to recertify? Perhaps you're ready to obtain your P3 or P4 rating and just need to be checked out and write the test. Well we can help you get your rating. Some ground school can prepare you for the appropriate HPAC test, with an emphasis on Canadian specific topics such as air regulations. After confirming your ability to kite, launch, fly and land appropriately for your skill level and with the successful passing of the test, you will obtain your rating from HPAC. Classes run from mid April to October. Course discounts available with new equipment purchases.